Is this our first look at the Sony Xperia Z3? Is the Z2 about to become outdated? Sony has gone flagship mad lately, releasing a new one every six months or so, so it's about time we caught a glimpse of the Sony Xperia Z3...and we might just have done that thanks to a leaked image. The photo, posted to Digi-wo, shows the front of a white Sony smartphone and there's not a whole lot to take away from it. It has the same OmniBalance design as many other Xperia handsets but if anything it looks more like the Sony Xperia T3 than the Xperia Z2, though unlike the T3 it's likely to have a glass back. There's also a smaller black handset next to the Z3 and that's purportedly an Xperia Z3 Compact, which may mean Sony is skipping over the Z2 Compact. Rumours accompanying the images suggest that both the Z3 and the Z3 Compact will have Snapdragon 801 processors, however earlier rumours pointed to the Z3 having a 2.7GHz quad-core Snapdragon 805 processor, alongside 3GB of RAM and an Adreno 420 graphics chip clocked at 500MHz. Whispers also claim that it will have a 1080p display and a PVD coating, which will give the phone extra scratch and impact resistance. We've heard nothing else at all about the Z3 Compact, but going by the Xperia Z1 Compact we'd expect the specs to be much the same, albeit with a smaller and possibly lower resolution screen. 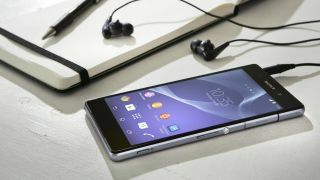 The only release date news we've heard suggests that the Xperia Z3 could be here as soon as August, in which case a lot more information and photos are likely to show up soon. However, it's much more likely to show up at IFA 2014, which was the site of the Xperia Z1 launch - so it could be another phone readying to take on the iPhone 6 in the battle for your pocket. Will the Xperia Z3 be a match for the Samsung Galaxy F?